this easy-to-read document systematically takes the reader through the benefits of high quality Early Childhood Development (ECD) for the individual, society, the economy and the education system. It provides a crisp exploration of why early learning makes such a difference, also exploring the barriers in this regard. 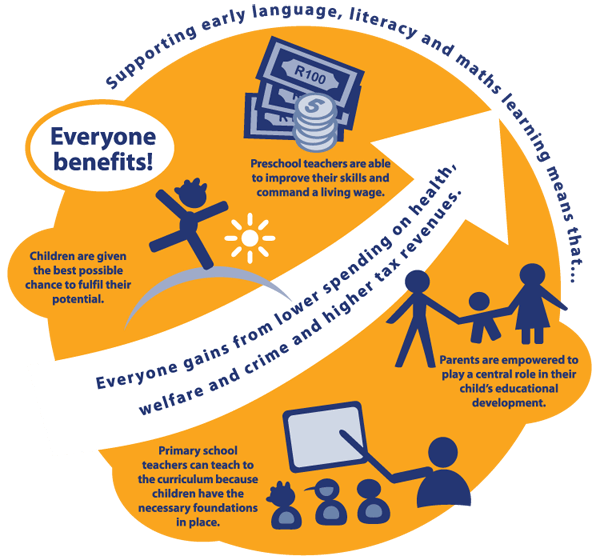 A reflection on the central role of language, literacy and maths learning as part of a high quality, holistic ECD package and a useful infographic on the implications and benefits of early learning ensures that this document makes a succinct case for putting early language, literacy and maths learning at the heart of quality ECD services.